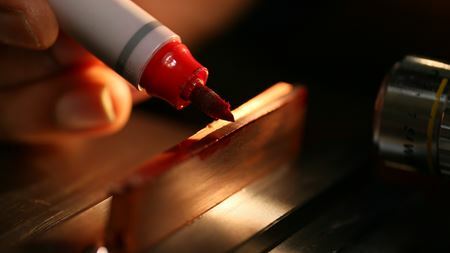 Applying a permanent marker, glue or tape to gummy metals such as aluminum makes them much easier to cut for industrial applications. A novel polymer material can change its structure in response to light, converting from a rigid substance to a softer one that can heal itself. A new microscopy technique can track microstructural changes in materials in real time as they are exposed to extreme heat and stress. Researchers have discovered that entangled, long-chain polymers in solutions relax at two different rates after processing. By infusing a magnetic fluid in a micro-structured solid substrate, researchers have created a dynamic surface with reconfigurable topography.